I was extremely enthusiastic when I received the phone call from Judy Parker, David Morris International’s Vice President of Marketing, asking me to host the A-ROSA Flora Rhine departure from Basel, Switzerland to Amsterdam. A-ROSA River Cruises has gained great traction in North America within the last year. Many agents are recognizing the appeal of an all-inclusive, contemporary, modern riverboat company. A-ROSA includes gratuities, port charges, all alcoholic and specialty drinks, and most shore excursions. My excitement about this riverboat cruise is based on several reasons. First and foremost, I have been looking forward to seeing the brand new A-ROSA Flora, which just made her debut this year. A-ROSA’s newest vessel has been receiving quite the buzz lately for her pleasant and open atmosphere, warm and accommodating staff and the relaxed onboard experience. With just 81 staterooms, A-ROSA Flora boasts a Family Suite, seven Junior Suites, four Balcony Suites and French Balcony Suites. Which means that over 50 percent of the staterooms have their own French Balcony. I love old movies. Have you ever seen the movie with Humphrey Bogart and Ingrid Bergman? Bogart asks Bergman, “Of all the gin joints, in all the towns, in all the world, she walks into mine…” This is how I feel about riverboat cruising. Inevitably you run into fellow cruise mates! I flew into London, Heathrow today in order to connect to Basel, Switzerland. There were at least ten lines processing through customs. One couple walked in front me and asked to get by so they could move to the end of the line. Long story short, I told them to get in front of me since I had four hours to make my connection. It turned out that this couple, Noel and Ursula, are sailing on A-ROSA’s Sept. 13 sailing from Basel to Amsterdam. What a small world. We were fast friends. I’m looking forward to sharing my upcoming trip with you. I’m staying at the Basel Hotel in the city center and will give a separate review of the hotel. This is the perfect opportunity to share two points of view. I am sailing with my 77-year old mother. It will be wonderful to get two different perspectives on the itinerary and riverboat cruise experience. Oh, and by the way, I am a tennis aficionado! 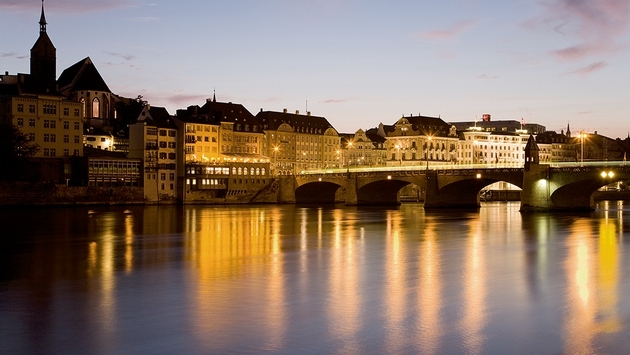 The fact that Basel is Roger Federer’s home town is very appealing. While dining at Cafe Restaurant Zum Schmale Wur on the Rhine, we met two ladies who had met Roger Federer and knew all about his upbringing. I highly recommend Zum Schmale Wur if you are looking for an authentic, traditional Italian restaurant. The people who frequent this restaurant are locals and the food is not only fresh, but typically Italian. Tune in next for my first full day in Basel, Switzerland and embarkation on the brand new A-ROSA Flora. Dani Johnson is a cruise industry veteran with experience in sales, holding previous positions with Crystal Cruises, Orion Expedition Cruises and now A-ROSA Cruises.